Guys, making yogurt is so much easier than I remember from the two times I tried to make it my first year out of college. You should definitely try it if yogurt is a thing you like and you have a cooking thermometer! I made mine with extra whole milk that was leftover from making sausage and biscuits for a recent brunch potluck. (Why did I think I needed a gallon of milk for a recipe that called for 5 cups?) It turned out creamy and smooth and delicious. If I had maple syrup left in my house, I would flavor it with that, but as it is, I've been eating it with ripe cherries or a bit of agave syrup. Delicious! Also, note that this was the yield from a half gallon of milk, and plan accordingly. It keeps for about 2 weeks in the fridge, but this is still a lot more yogurt than we would normally consume in 2 weeks. Pour the milk into a pot over medium to medium-high heat. Warm the milk to right below boiling, about 200°F. Stir the milk gently as it heats to make sure the bottom doesn't scorch and the milk doesn't boil over. After it hits 200°F, take it off the burner immediately and let the milk cool to 112°F to 115°F. You can either wait patiently or use an ice bath to bring it down. Either way, stir the milk gently to cool it off and keep a skin from forming. When the milk has cooled, scoop out about a cup with a large measuring cup and add the yogurt. Whisk until smooth and the yogurt is dissolved in the milk. Then, whisk the thinned yogurt into the large pot of milk. Cover your pot with a lid and wrap it in a towel before putting it in a turned-off oven. You want to keep the yogurt at around 110°F, and wrapping it in a towel in the oven did the trick for me. You can also use a dehydrator or a yogurt maker. Let it set for at least four hours, or overnight. I did overnight and in the morning, it was pretty well set, with the texture of Brown Cow cream top (after you've stirred in the cream top). 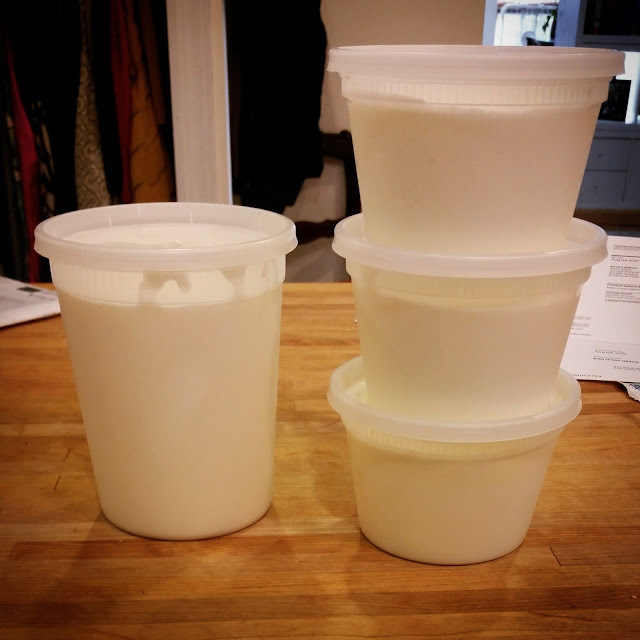 When you've reached the consistency you like, go ahead and give it a stir (or drain off the whey, if you'd rather), and transfer the yogurt into containers before storing them in the fridge.